Strain 2-79 is a biocontrol agent against take-all, an important disease of wheat caused byGaeumannomyces graminis var.tritici. In the rhizosphere, it produces the antibiotic phenazine 1-carboxylic acid (PCA) as the primary means of disease suppression. One barrier to commercial use of phenazine-producing pseudomonads, like strain 2–79, is the lack of liquid-culture technology for mass production. 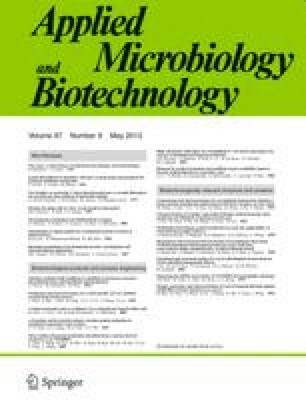 For instance, there is little published research concerning the impact of liquid-culture secondary metabolism on the biocontrol qulaities of the cell harvest, i.e., efficacy, phytotoxicity, and storage survival. Yet it is important to know whether the fermentation process should be designed to enhance or eliminate secondary metabolite accumulation. To enable future exploration of this issue, we identified liquid-culture parameters that could be manipulated to control the phenazine productivity of strain 2–79. Our results indicated that PCA accumulation was very sensitive to the culture pH and temperature. It was possible to produce large cell populations with either high or low phenazine productivity by choosing to control culture pH at 7 and 8 respectively. Although high cell accumulations were achieved over the broad 25–34°C range studied, high, moderate, or low PCA productivities were observed at 25–27°C, 29–32.5°C, or 34°C respectively. When pH was controlled at 7, specific PCA productions at 25°C could be modulated by the choice of carbon source supplied. PCA accumulation per unit biomass reached 0.31 g/g on glucose, 0.16 g/g on glycerol and xylose, and only 0.09 g/g on fructose. Although the nitrogen source was also tested as a variable, it had little influence on culture PCA productivity under controlled pH.